MS69: Un-Circulated with perfect lustre, sharp, attractive strike and very exceptional eye appeal. A perfect coin except for microscopic flaws (8x magnification) in planchet (pre-strike), strike or contact marks. Professional Coin Grading Service (PCGS) represents the industry standard in coin certification. By establishing a universal grading standard, PCGS has paved the way for coin investors to enjoy buying and selling coins with confidence. The 1oz gold Krugerrand, one of the world's most famous bullion coins celebrates its 50th anniversary in 2017. This special privy edition Krugerrand will have a limited mintage of just 100,000 and demand is sure to be high. The world's most widely held and actively traded gold bullion coin. During the late 1960s and early 70s, when South Africa's annual gold mine output averaged 75% of total output in the western world, the promotion of gold was considered vital, following the final collapse of the Gold Standard in 1971. The Krugerrand was the world's first ounce-denominated gold coin. Although they are legal tender, they have never recorded a face value on their obverse or reverse sides. This was done to emphasise that the value of each coin is directly related to the prevailing value of their fine gold content. They were mass produced to enable the "man in the street" to purchase gold easily and with confidence. The first 22k gold Krugerrand was minted on 3 July 1967. Since its inception more than 50 million Krugerrands in all sizes have been minted. 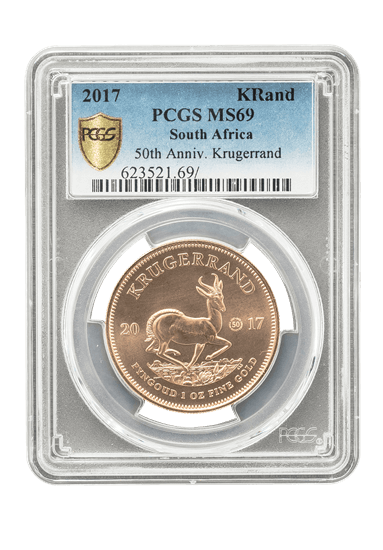 PCGS 2017 1oz Gold South African Krugerrand MS69 has been added to your shopping cart!